Maybe I’m Not a Cheapskate? You are here: Home / Frugal Living / Maybe I’m Not a Cheapskate? I consider myself a frugal living zealot, a crazy coupon clipper, a cheapskate. But this week, Amy at Mom Advice started a movement that challenged everything I think about myself. She’s made a pledge not to spend any money for the entire month of February. She does acknowledge that the challenge would be nearly impossible, so she’s got a few exceptions: $250 a month for groceries, utility payments, and gas for cars. And she’s encouraging others to step up to the no-spend challenge. At first, I was all over this. I love a challenge. I love showing that I can be disciplined. But then I really thought about what no spending for a month would mean to our family. And the more I thought, the more it upset me. It’s not that I don’t think we can do it, it’s that I don’t want to. Maybe I’m not as much of a cheapskate as I thought. Or maybe it’s just that we run our budget so tightly already. And I’m so tired of being surrounded by such sad economic stories from every corner of the media. I simply cannot cut any more. My frugal lifestyle has already helped me appreciate the beauty around me, the joy of family, and the freedom having no debt provides. What more is there to prove to myself? What do you think? 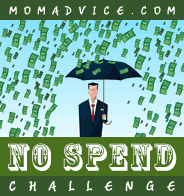 Could you go a month without spending any money?